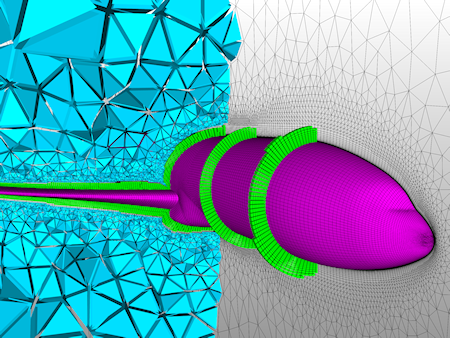 Pointwise announces the latest release of its eponymous computational fluid dynamics (CFD) meshing software in which the ability to rapidly generate layers of hexahedral cells has been significantly enhanced. "The enhancement involves how the software combines high aspect ratio – anisotropic – tetrahedra into hexahedra," said Dr. John Steinbrenner, Pointwise’s vice president of research and development. Near-wall and near-wake hex layer generation is the latest capability added to T-Rex (anisotropic tetrahedral extrusion), one of Pointwise’s hybrid meshing techniques. The technique extrudes stacks of anisotropic tetrahedra off a surface mesh. A post-processing step combines stacks of tetrahedra into either prisms or hexahedra. In addition to reducing cell count and thereby CPU time, most CFD solvers compute more accurate answers with prisms and hexahedra in boundary layers and wakes.